stay in self-contained luxury apartments with full resort facilities. Please use the booking table below to check availability. Enter the promo code ‘hwk012017‘ in the box below. The inclusions will be added after check out. 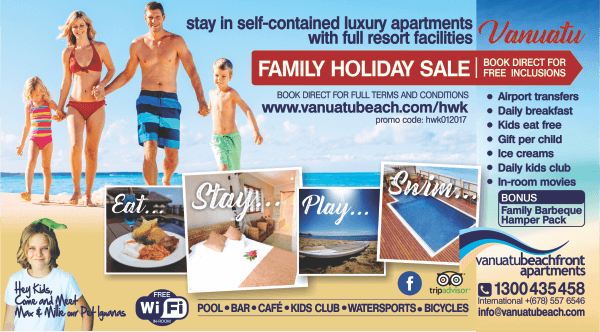 – Accommodation must be paid in full 4 weeks before check in date. If your booking date is within this period full payment must be made at time of booking. – Airport transfers are valid in both directions to and from the international airport for up to 6 people with 6 suitcases. If you are travelling with surfboards or sporting equipment surcharges may apply. Does not include pick up or drop off to other areas of Vanuatu and everyone must be travelling at the same time. – Kids Eat Free from the kids menu only. 1 free kids meal with each paying adult. – Gift per child pertains to those 12 or under. Childrens ages and gender must be advised a minimum of 1 week before check in to qualify. – Children under the age of 12 are eligible to receive 1 free icecream cone per day. – BONUS BBQ Hamper is valid for a family of 2 adults and 2 children and is redeemable on Monday to Friday and must be booked in 48 hours before your check in. Additional adults are charged at 1250vt and Additional Kids under 12 are charged at 500vt each.